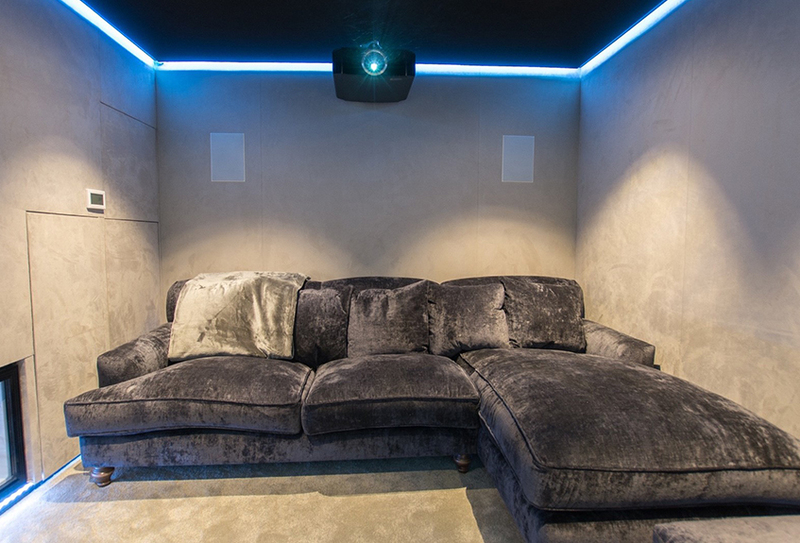 Our client first approached us after deciding they’d like to utilise a tiny basement room to “create a cinema type experience”. 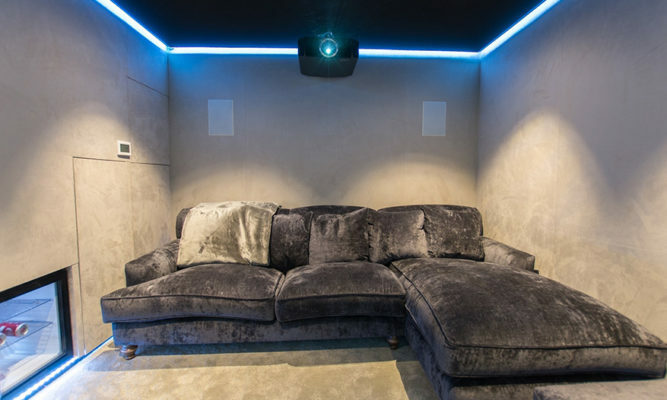 During the months that followed it was then left to us to design and coordinate the complete transformation of an almost unusable space into one which would deliver something truly unique from the moment you step into the room, with the aim of creating a rather special, hidden cinema room for the client and his young family to escape to. for the greatly reduced size space, opting to use a mix of slender and shallow speakers that could be neatly concealed within a very limited font­wall build out. The room itself was our first challenge. Being just 4m long by 3m wide, and only 1.6m in height, it required some work to make it a usable and safe place! During the following weeks the fireplace was removed and minor excavation undertaken to achieve a slightly increased length and a more liveable height of just over 2m. This Cinema was specifically designed as a family space, for regular use by the children (whom are currently 1 & 2yrs old). For this reason it was considered unwise to provide a system which delivered extreme SPL levels, especially in a room and home which so limited in size meant sound transference would be common. Therefore, to maximise sound quality over SPL levels, we recommended the room be acoustically treated on all walls and the ceiling. 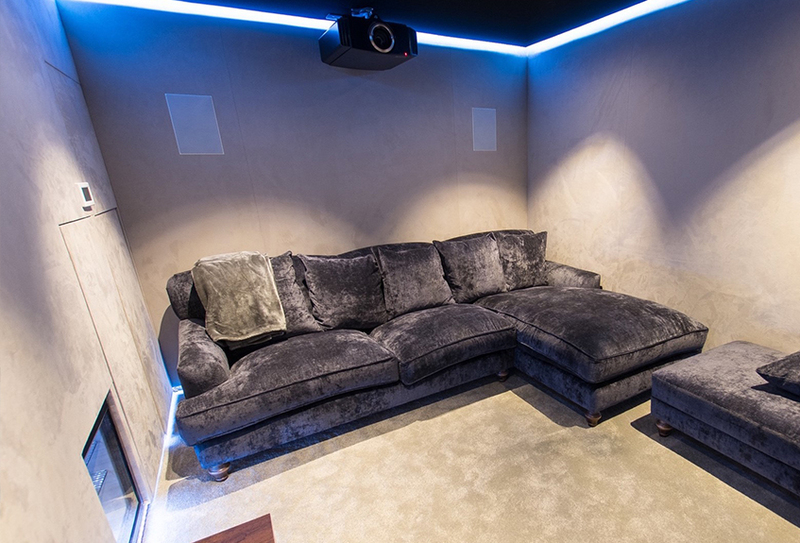 In order to really transform the room visually, this extremely shallow treatment was then hidden behind our recommend suede stretch fabric, which lined all wall and ceiling surfaces as well as the main door to the room. To complete the look we redesigned the spacing of joists supporting the stairs in order to maximise space in order to create a bespoke under stairs cupboards (housing our system rack) and a drinks cooler. The budget for the project was initially quite limited, with an original client expectation of limited more than £10,000. 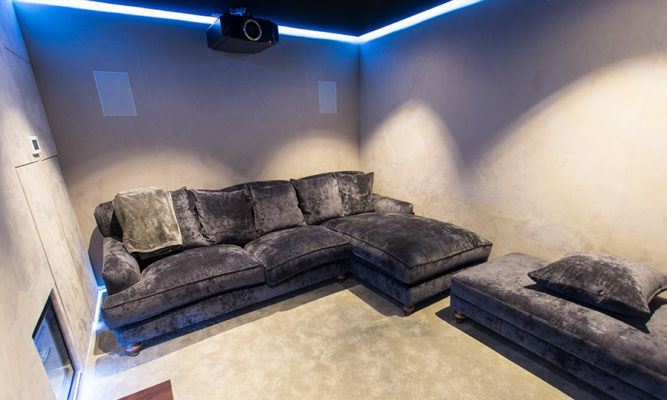 Following several consultations this budget was increased as necessary to ensure the room would deliver a that high end cinema experience, utilising the latest projector and audiophile grade speakers, whilst ensuring convenience and ease of use for both the adults and young children, by integrating facilities such as a Movie Server to store their films, and a control system. Since recent completion of the room the feedback has been exceptionally positive, it has become “a truly lovely space” which they are obviously very pleased with. It’s the secret escape they always hoped for and evident they’ve been keen to show friends, family and neighbours as we’re told further work is due to come others seeing it.